Location: The east side of the A1 at Union Mills just south of its junction with A22.. Present state: Steps leading down to station site are still extant as is the Peel bound platform. A short section of track has been placed on its original alignment and a rail mounted crane is mounted on it. Notes: Union Mills Station was one of the original stations on the Isle of Man Railway’s Douglas to Peel line. The station was opened with the line on the 1.7.1873 to serve the nearby village of Union Mills. 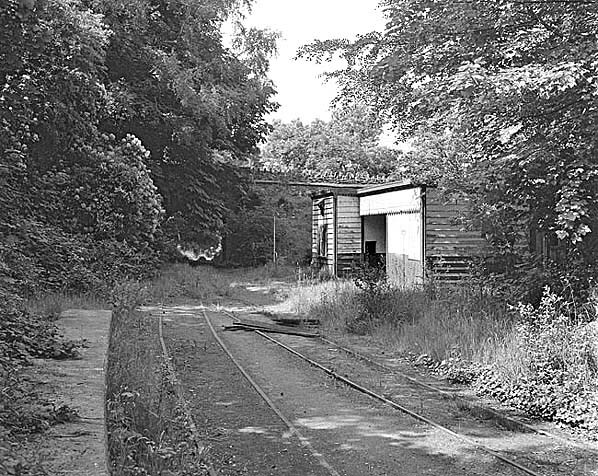 The Douglas to Peel line was a single track railway but a passing loop was provided at Union Mills. When the station opened it was not provided with raised platforms but interestingly one raised platform was provided on the westbound (Peel) line in 1906/7. Passengers heading towards Douglas continued to board trains from rail level. The station was situated in a cutting and was connected to street level by a set of steps that still survive today. Passenger facilities where provided by a wooden building situated on the west bound (Douglas) side of the station. When the Station opened in 1873 it was served by trains running between Douglas and Peel. At some point after September 1879 some through services from and to the Manx Northern Railways St Johns to Ramsey line operated through the station. In 1905 the Manx Northern Railway was taken over by the Isle of Man Railway and services operated from Douglas to both Peel and Ramsey on a regular basis. that trains still dropped passengers off at the Station site during the following summer. 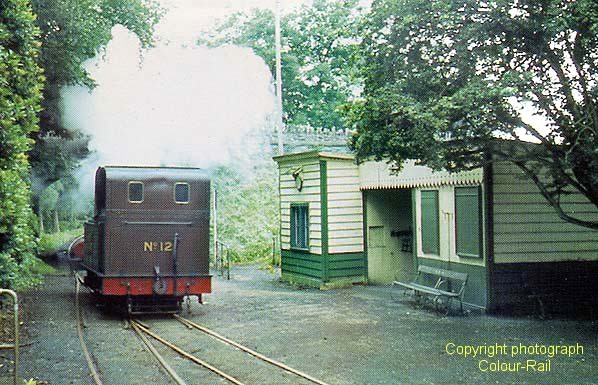 Services on the Douglas to Peel and Ramsey lines continued to pass through the site until the 13.11.1965 when all of the lines on the Isle of Man Railway system closed due to the condition of the track which had received only minimum maintenance for many years. A rescue package was put together which saw Union Mills station re-open with the line on the 3.6.1967. However financial problems continued to plague the Isle of Man Railway and the Douglas to Peel line closed along with all of its stations on the 7.9.1968. The St Johns to Ramsey line had closed one day earlier. Various attempts where made to re-open the Douglas to Peel and Ramsey lines but eventually they were sold for scrap and lifted between 1974 - 5. 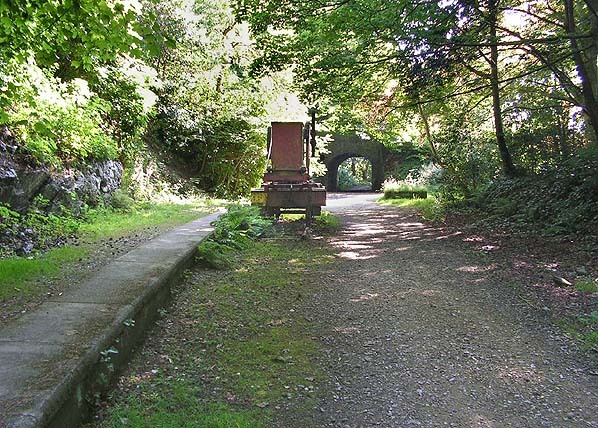 Today the trackbed through Union Mills forms part of a long distance footpath and cycleway. 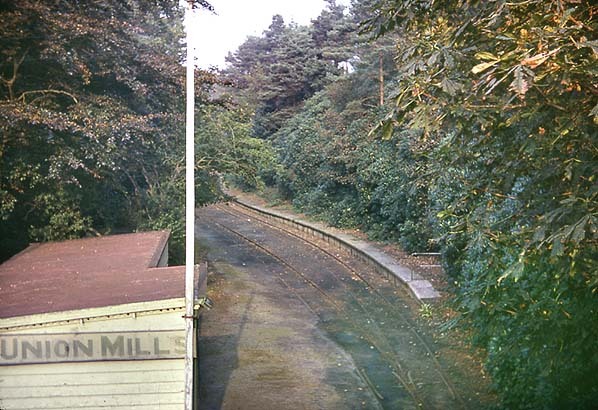 Union Mills looking west from a similar viewpoint in June 1974, shortly before the track was lifted. Union Mills looking west in August 2006. A short section of track has been reinstated and a rail mounted crane stands as a memorial to the Douglas - Peel line.